Local Active Adult builder Roger A. Glover III proud to launch first Richmond project FOR IMMEDIATE RELEASE Contact: Dotti Houlihan Telephone: 804-335-8510 Email: dhoulihan@cornerstonehomes.net RICHMOND, Virginia (May 30, 2014) — Cornerstone Homes, LLC is proud to announce the Grand Opening of Villas at Magnolia Lakes, June 14th & 15th. The Richmond-based builder will be opening the new sales office, and introducing new maintenance-free single story villa floor plans. Members of the sales staff, as well as the president of Cornerstone Homes, Roger A. Glover III, and the vice president of operations, Brian Schwindt, will be on hand to answer questions. Attendees will be able to mingle with current homeowners, tour the clubhouse and pool areas, and explore what life is like at Villas at Magnolia Lakes. The Grand Opening will take place from 1 to 5 PM in The Magnolia Club community clubhouse. 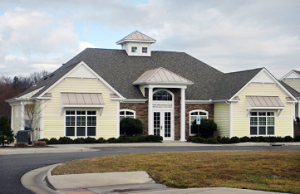 Located in Chesterfield County, on Ironbridge Road at Chalkley Road, and within convenient proximity to shopping, medical centers, public parks and entertainment, Magnolia Lakes is a no maintenance lifestyle community with homes specifically designed for empty nesters and retirees. “90% of our homeowners are people who are retired or close to retiring, “ said Cornerstone spokesperson Dotti Houlihan. The carefree Magnolia Lakes lifestyle includes amenities like the clubhouse, fitness center, pool, poolside fire pit lounge, kitchen and bar, a lake fishing pier and canoe launch, lakeside walking trails, and yoga on demand! Originally begun in 2007, progress on Magnolia Lakes stalled during the recession. The community was originally designed to include 130 condominiums and 50 single-family detached homes. Only 28 condos, the clubhouse and pool were completed when development ceased in 2011. “I was looking for the right opportunity to develop and build a premier retirement community in my hometown,” says Mr. Glover, who has been in the building industry for 25 years. He found that golden opportunity when Magnolia Lakes became available. In December 2013, Mr. Glover worked closely with the existing residents, Chesterfield County officials, and the previous developer to obtain the 30-acre project, which includes the completed homes, 106 ready-to-build lots, the clubhouse, pool, lakes and an additional undeveloped 15 acres designed for 50 more detached “cottage-style” homes. Cornerstone will continue to build one-level, no-maintenance, energy-efficient, ADA compliant homes on the remaining lots, as well as make improvements to the clubhouse, fishing lake and other recreational facilities and amenities. The company’s goal is to enhance the quality of life for both current and future homeowners. Cornerstone plans for new homes to be completed for new residents before the end of 2014. Current resident Ed Newman has lived at Magnolia Lakes for three years and says the key reasons he chose Magnolia Lakes were the convenience, ease of living, and the opportunity to be active.